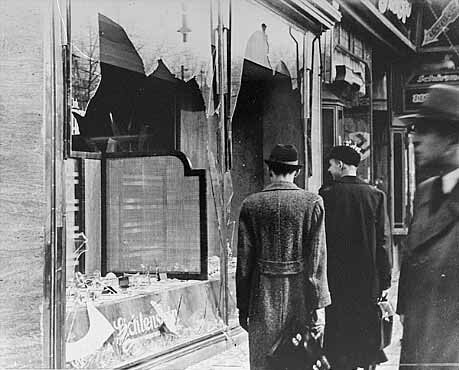 Category » Kristallnacht - "Night of Broken Glass"
Almost immediately upon assuming the Chancellorship of Germany, Hitler began promulgating legal actions against Germany's Jews. In 1933, he proclaimed a one-day boycott against Jewish shops, a law was passed against kosher butchering and Jewish children began experiencing restrictions in public schools. By 1935, the Nuremberg Laws deprived Jews of German citizenship. By 1936, Jews were prohibited from participation in parliamentary elections and signs reading "Jews Not Welcome" appeared in many German cities. (Incidentally, these signs were taken down in the late summer in preparation for the 1936 Olympic Games in Berlin). In the first half of 1938, numerous laws were passed restricting Jewish economic activity and occupational opportunities. In July, 1938, a law was passed (effective January 1, 1939) requiring all Jews to carry identification cards. On October 28, 17,000 Jews of Polish citizenship, many of whom had been living in Germany for decades, were arrested and relocated across the Polish border. The Polish government refused to admit them so they were interned in "relocation camps" on the Polish frontier. Among the deportees was Zindel Grynszpan, who had been born in western Poland and had moved to Hanover, where he established a small store, in 1911. On the night of October 27, Zindel Grynszpan and his family were forced out of their home by German police. His store and the family's possessions were confiscated and they were forced to move over the Polish border. Zindel Grynszpan's seventeen-year-old son, Herschel, was living with an uncle in Paris. When he received news of his family's expulsion, he went to the German embassy in Paris on November 7, intending to assassinate the German Ambassador to France. Upon discovering that the Ambassador was not in the embassy, he settled for a lesser official, Third Secretary Ernst vom Rath. Rath, was critically wounded and died two days later, on November 9. The assassination provided Joseph Goebbels, Hitler's Chief of Propaganda, with the excuse he needed to launch a pogrom against German Jews. Grynszpan's attack was interpreted by Goebbels as a conspiratorial attack by "International Jewry" against the Reich and, symbolically, against the Fuehrer himself. This pogrom has come to be called Kristallnacht, "the Night of Broken Glass." On the nights of November 9 and 10, rampaging mobs throughout Germany and the newly acquired territories of Austria and Sudetenland freely attacked Jews in the street, in their homes and at their places of work and worship. At least 96 Jews were killed and hundreds more injured, more than 1,000 synagogues were burned (and possibly as many as 2,000), almost 7,500 Jewish businesses were destroyed, cemeteries and schools were vandalized, and 30,000 Jews were arrested and sent to concentration camps [added by Mitchell Bard from his book The Complete Idiot's Guide to World War II. NY: MacMillan, 1998, pp. 59-60]. 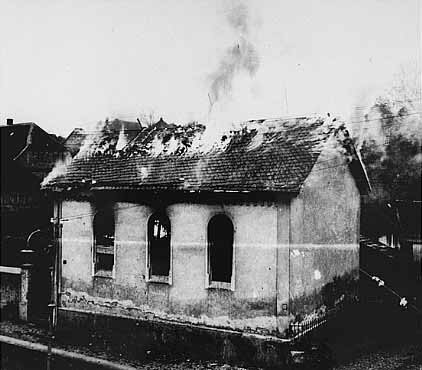 The burning of the synagogue in Ober Ramstadt (USHMM Photo). 'Since the problem is mainly an economic one, it is from the economic angle it shall have to be tackled. Because, gentlemen, I have had enough of these demonstrations! They don't harm the Jew but me, who is the final authority for coordinating the German economy. `If today a Jewish shop is destroyed, if goods are thrown into the street, the insurance companies will pay for the damages; and, furthermore, consumer goods belonging to the people are destroyed. If in the future, demonstrations which are necessary occur, then, I pray, that they be directed so as not to hurt us. 'Because it's insane to clean out and burn a Jewish warehouse, then have a German insurance company make good the loss. And the goods which I need desperately, whole bales of clothing and whatnot, are being burned. And I miss them everywhere. I may as well burn the raw materials before they arrive. By now it is clear to Hitler and his top advisors that forced immigration of Jews out of the Reich is not a feasible option. Hitler is already considering the invasion of Poland. Numerous concentration camps and forced labor camps are already in operation. The Nuremberg Laws are in place. The passivity of the German people in the face of the events of Kristallnacht made it clear that the Nazis would encounter little oppositioneven from the German churches. Jews were required to turn over all precious metals to the government. Pensions for Jews dismissed from civil service jobs were arbitrarily reduced. Jewish-owned bonds, stocks, jewelry and art works can be alienated only to the German state. Jews were physically segregated within German towns. A ban on the Jewish ownership of carrier pigeons. The suspension of Jewish driver's licenses. The confiscation of Jewish-owned radios. A curfew to keep Jews of the streets between 9:00 p.m. and 5:00 a.m. in the summer and 8:00 p.m. and 6:00 a.m. in the winter. Laws protecting tenants were made non-applicable to Jewish tenants. One final note on the November 12 meeting is of critical importance. In the meeting, Goering announced, "I have received a letter written on the Fuehrer's orders requesting that the Jewish question be now, once and for all, coordinated and solved one way or another." The path to the Final Solution has now been chosen. And, all the bureaucratic mechanisms for its implementation were now in place. ...as an eyewitness I was very emotionally involved in this event and its consequences. Like everyone else here in the United States, for some 50 years I called those horrible days and nights Kristallnacht. I changed my mind reluctantly when, during my research, I discovered Goering's intent to use this designation to ridicule this event. Chapter 6, titled "Die 'Kristallnacht' als Anfang vom Ende";, (crystal night as the beginning of the end) starts: "Man kann den November- pogrom als ein Ritual oeffentlicher Demueting deuten..." (The November pogrom can be explained as a ritual for public humiliation...) The photograph accompanying this chapter it titled: "Vielleicht gab das zersplitterte Glass Anlass zu dem "Spottnamen Reichskristallnacht." (Perhaps the broken glass was used to ridicule the pogrom). There are additional sources, but I hope the above will serve to illustrate the fact that, except for the United States, The November Pogrom appears to be the established term. So, it appears, the term "Kristallnacht" or "Crystal Night" was invented by Nazis to mock Jews on that black November night in 1938. It is, therefore, another example of Nazi perversion. There are numerous other examples of this same tendency in the language of the Nazi perpetrators: Sonderbehandlung ("special treatment") for gassing victims, Euthanasie for a policy of mass murder of retarded or physically handicapped patients, Arbeit Macht Frei (Work Makes you Free) over the entrance to Auschwitz. When the Nazis launched their plan to annihilate the remaining Jews in Poland in the fall of 1943, they called it "Erntefest," or Harvest Festival. While this may have been a code word, as Froma Zeitlin has observed, it had the same grim and terrible irony that is reflected in Kristallnacht as in so many other instances of the perverted uses of language in the Third Reich. Perhaps most cynical of all is the use of the term, "Endloesung der Judenfrage" (Final Solution of the Jewish Question), for what is now known as the Holocaust. Goebbels frequently used such terminology to amuse his audiences (usually other Nazi officials) and to further demoralize his victims. Of course, K-nacht was a pogrom of sorts, but it was a German event and more specifically still, a Nazi event. Replacing it with pogrom certainly sets it in the larger context of anti-Semitic massacres in European history, but it loses the German and Nazi contexts.